The Golden Globes nominations are out (Check out the TV specific list here, or the full list here), and provided you have no expectation of the Hollywood Foreign Press Association being logical in their selections they’re about what you would expect. So, in other words, they’re kind of ridiculous. For the most part, the nominations are driven by four separate impulses, all of which are almost like fetishes that the HFPA (who are mysterious and generally not very reputable) refuses to give up year after year. Their desire, at the end of the day, is to create nominees that bring in audiences and that provide them a false sense of credibility: after all, if every A-list Hollywood star who happened to be in a movie this year gets nominated, who dares to question what the Golden Globes aren’t connected with popular culture? Of course, when it comes to both film television there’s much more involved than popular culture, so let’s take a look at the three main impulses of the HFPA (on the TV side, at least), and then after the jump offer a bit more analysis. If you’ve been on a hit show before, your chances of being nominated skyrocket. Julianna Margulies, nominated for the Good Wife, spent years on E.R. Courtney Cox, nominated for Cougar Town, was on a little show called Friends. Edie Falco, nominated for Nurse Jackie, was on another little show called The Sopranos. These aren’t always undeserving nominees (I don’t entirely disprove of any of these candidates, although Cox is not even close to the best thing about Cougar Town), but they are always there as much for their previous fame as they are for their current role. The HFPA wants nothing more than to be relevant, but their idea of relevancy is fetishizing the new. Yes, Glee fit into the show’s love for musicals (which, after all, kind of have their own category in the film awards), but it was also something new and shiny, which gets Lea Michele, Matthew Morrison, and Jane Lynch nominations. 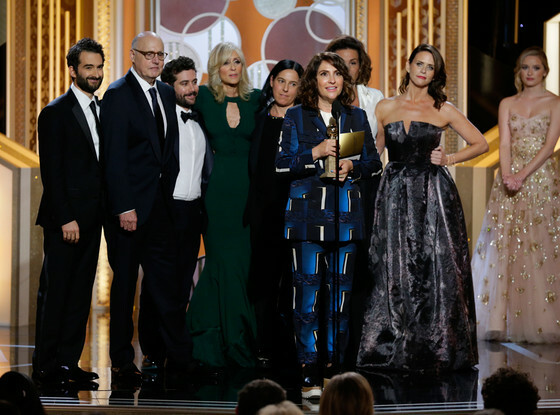 And Modern Family, without a single other nomination on the board, sneaks into Best Comedy Series – I’d say it’s because you just can’t separate anyone from the ensemble, but frankly it’s just because the Globes only value it for its newness. When in doubt, you can presume that a HFPA member has turned their television to HBO: the network’s pedigreed garnered a host of nominations which in some ways fly against the previous lenses, both positive (Big Love grabs three noms for series, Bill Paxton and Chloe Sevigny, Hung grabs acting nods for Thomas Jane and Jane Adams) and negative (Entourage picks up a best series not over Hung, Nurse Jackie, United States of Tara, Anna Paquin gets nominated over Katey Sagal, etc.). It’s like HBO is their default, which isn’t always a terrible thing (I really liked Hung) but does feel like a leftover impulse from the Sopranos era considering the breadth of great drama/comedy on other cable channels (Sons of Anarchy, Breaking Bad).